Europe's Family Tree Gets A New Branch : Shots - Health News Genetic evidence from ancient humans and modern people suggests that travelers from northern Eurasia moved south several thousand years ago. They stuck around to have kids with early European farmers. 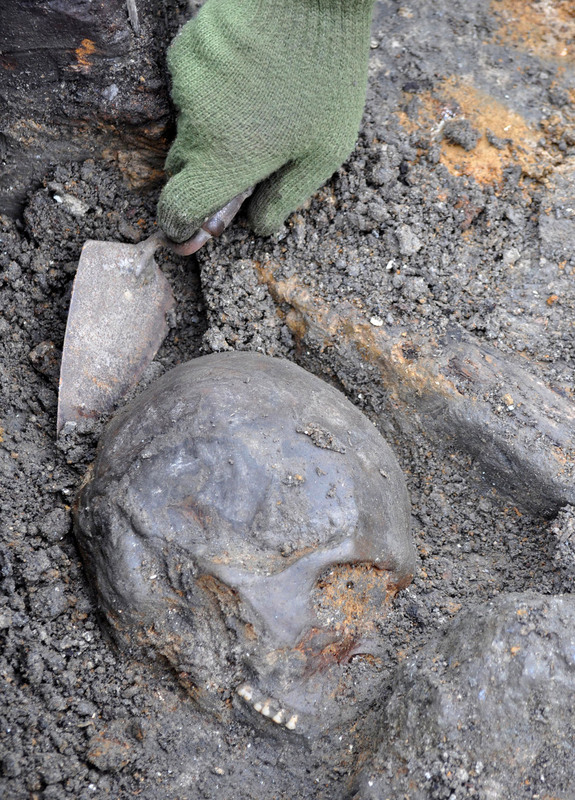 This skull, from the Swedish archaeological site called Motala, is thought to have come from a hunter-gatherer who died there about 8,000 years ago. For those who eagerly trace their genetic lineage or subscribe online to find their earliest ancestors, there's a new group to consider adding to the furthest reaches of your list. A previously unrecognized population of ancient north Eurasians may be a major third braid in the genetic twist that gave rise to most modern Europeans and their kin. Scientists have known from previous work that more than 8,000 years ago, a population of dark-haired, light-eyed hunter-gatherers from Western Europe, and a group of dark-haired, brown-eyed farmers from the Near East got together and had kids. But new data suggest a third group from north Eurasia may have swaggered into the ancient party many years later — after agriculture was introduced — contrary to previous thought. These traveling Eurasians are evidence that people were moving into Europe later than expected, scientists now say, after the continent was already densely settled. The evidence, from a team led by geneticist David Reich, at the Howard Hughes Medical Institute, and Johannes Krause, at the University of Tübingen, in Germany, was published Wednesday in Nature. The scientists analyzed DNA from nine ancient skeletons and from 2,345 modern-day people from across the globe. In particular, you might thank the remains of a 7,000-year-old farmer from Germany and eight 8,000-year-old hunter-gatherers from Luxembourg and Sweden; DNA from their bones or teeth was harvested for science. "We were using the whole genome," Reich tells Shots, which means they compared the DNA libraries of each individual, looking for areas in the genome that are variable among different populations. In the end, their statistical analysis found that a computer model incorporating these three very different populations of ancestors seemed to best explain the genetic patterns seen among most Europeans today. Prior to the study, the third lineage was considered a "ghost population" — thought to exist, based on genetic patterns seen in the genomes of modern Europeans, but without any ancient DNA evidence to confirm that. Interestingly, though Reich's team solved the mystery of one ghost population, they've created another. Their genetic data indicates that there's likely at least one more group whose physical remains haven't yet turned up: "It's a population that split off from all other Eurasian populations before they separated" into the three, Reich says. "I think the most exciting aspect of this work is that it is a powerful demonstration of how ancient DNA analyses can provide insights into human history that would be difficult, or impossible, to make from genetic data of contemporary individuals alone," says Joshua Akey, a geneticist at the University of Washington School of Medicine. "I suspect this study, and several others recently published, are a harbinger of things to come."